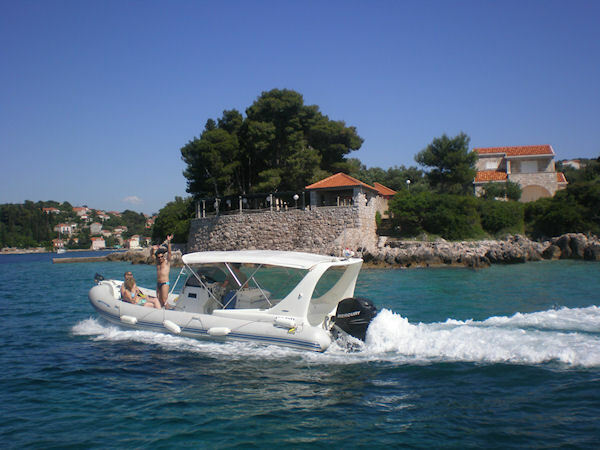 Embark on your speedboat at the pier in Gruz, sailing along the magnificent Dubrovnik City Walls & Lokrum. After the panorama cruise the excursion continues to the wild side of Kolocep Island where you can experience snorkeling in the caves and see the beautiful, wild nature of the sea bottom. The excursion continues with riding on tubas towards the Island of Kolocep settlement of Donje Celo and the beach. You will have free time to relax in the sun and swim, or you can choose to ride on tuba through the bay. After free time you will have a snack in the restaurant Vila Rose were you can try the taste of traditionally made fish, fresh baked bread and drinks. Menu includes: Fish pate, Dalmatian dry ham with cheese, carpaccio anchovies in olive oil on salad, salted dry anchovies with onion and copperas. Homemade dessert, wine, beer or soft drink (1 drink per person). Please note: Weather conditions may affect underwater visibility. The order of sights visited may vary. This tour is not suitable for guests with heart or neck problems and for women who are pregnant. Minimum age to participate is age 7 and any child under 14 must be accompanied by an adult. Minimum of 5 passengers required. Don't forget to bring your towel, swimsuit and sunscreen. Please note: Weather conditions may affect underwater visibility. The order of sights visited may vary. This tour is not suitable for guests with heart or neck problems and for women who are pregnant. Minimum age to participate is age 7 and any child under 14 must be accompanied by an adult.